'Acquiring an Aquatic . . . finding the next Aquatic Warbler in Ireland' by Eugene Archer. Aquatic Warbler (Acrocephalus paludicola) has several distinctions; apart from being one of the most beautiful of European passerines, it is also one of the most enigmatic, one of the rarest and, by consequence, it is now a rather difficult species to see away from it's breeding territories. There have been 13 Irish records (see full list here), the last being a bird on Cape Clear Island as far back as 1989 and the level of effort and luck necessary to find the next one has increased in relation to it's current, rather precarious status. However, there is still every reason to believe that one or a few birds may wander far enough west to reach Ireland each autumn and that someone will eventually find another one. During the last two years I have been fortunate enough to spend a considerable amount of time at a ringing station on the Loire estuary in north-west France which is situated on the post-breeding migration route for Aquatic Warbler and is perhaps the best site in France for the species (Bargain 2006, Doxa 2008). The ringing station is managed by ACROLA (Association pour la Connaissance et la Recherche Ornithologique Loire et Atlantique) and up to 15,000 birds are trapped each autumn from July to October. I have handled over one hundred Aquatic Warbler specimens and I have also had a few brief opportunities to see individuals in the field. This article is based on that experience and I hope it will stimulate and encourage as many birders as possible to devote some time to finding Ireland's next record. To put the situation into perspective it's worth noting a few things about the general ecology of Aquatic Warblers. At the turn of the 20th century it was still a reasonably common breeding species in many western European countries but a change in the species fortunes was brought about, particularly from 1970 onwards, through loss of habitat by drainage and through changes in land use and management. Their current distribution covers a small area in eastern Germany, Poland, Lithuania, Latvia, Belarus, Ukraine, Hungary and Russia with the most recent estimate (2007) putting the global population at around 13,200 singing males (BirdLife International 2010). So, while we know where they are breeding we still have relatively little information about where they spend the winter period. The wintering grounds of the western and central European populations were only discovered as recently as 2007 and lie somewhere in western Africa south of the Sahara; including sites in Mali, Mauritania and in Senegal (Bargain et al 2008, Foucher & Boucaux 2010). Much work still needs to be done to find further African wintering sites as rapidly changing land use there could have a catastrophic impact on the species in a very short amount of time. As with much of what is currently know about Aquatic Warblers it was the results of ringing studies that led to the discovery of the prospective wintering grounds and which have provided quite a clear map of the route that many, if not most, European Aquatic Warblers take on their autumn migration (Juillard et al 2006, Neto et al 2010). While the autumn migration route has been established the same cannot be said for the return migration route in spring. Like several other European species which take a westward route in autumn the Aquatic Warbler is suspected of taking a more direct and easterly route back to the breeding grounds in spring. Spring records in Western Europe in this period are extremely rare indeed (de By 1990) and the situation does not seem to have changed very much in the past 20 years. A recent study in the Camargue (Poulin et al 2010) managed to record several birds in spring 2009 by targeting their efforts in suitable habitat and their findings lend weight to the more direct, easterly route theory. Adult birds, comprising many males, seem to begin leaving the breeding grounds from the end of June and the first ones are generally recorded in northern and western France from the second week of July onwards having passed along the German and Dutch North Sea coastlands. Juveniles and females depart shortly afterwards and the first big wave of birds occurs during the middle ten days of August. Until the last birds in late September another mini-wave or two (females and 2nd brood juveniles?) can occur depending on the meteorological conditions. Phenology studies have suggested that birds depart the breeding grounds early in dry summers and later in wet ones presumably lingering if the insect food supply is still plentiful (Cheneval et al 2009). In southern Britain records from the past 10 years begin in the first week of August with birds along the south coast as might be expected but the records were also widely scattered from the Shetlands to Cornwall and, perhaps more interestingly from an Irish perspective, to south Wales. The focus is still on the south and south-west coasts in September while the Scillies can claim the majority of records from October (www.birdguides.com). The key to all their movements appears to be tied in with their habitat preferences. They rely on a network of sites to rest and feed sometimes remaining several days before undertaking the next stage in their migration. 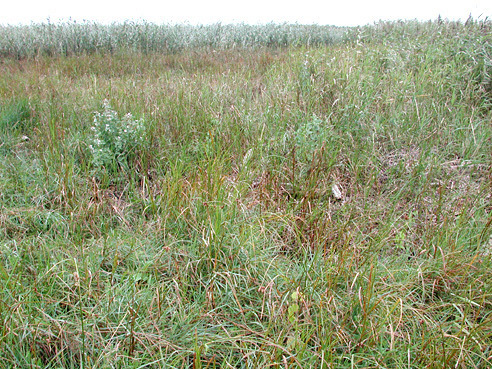 The vast majority of birds we trapped could be associated with a type of habitat surrounding the reedbed phragmites sp. and which was dominated by sedges carex sp., rushes juncus sp. and other herbaceous plants. Birds arriving into the reedbed during the night with other warblers appeared to be making their way to the edge before sunrise to search out areas for feeding during the day. 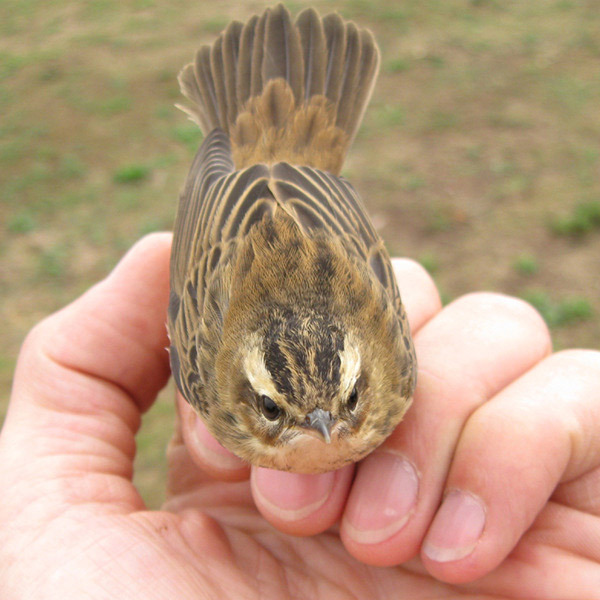 Most Aquatic Warbler activity was concentrated in the first 4 hours of the day after sunrise and the use of tape-lures at the station has a very positive effect in attracting the birds from the surrounding areas into the areas with nets. The song is quite distinctive compared to that of Sedge Warbler (Acrocephalus schoenobaenus) (see www.xeno-canto.org/europe) and to some extent the calls are also. Click on the thumbnail for a larger version. All photographs by Eugene Archer. Photo 1. Donges Est, Loire-Atlantique, France. August 2009. Aquatic Warblers prefered habitat during autumn migration. 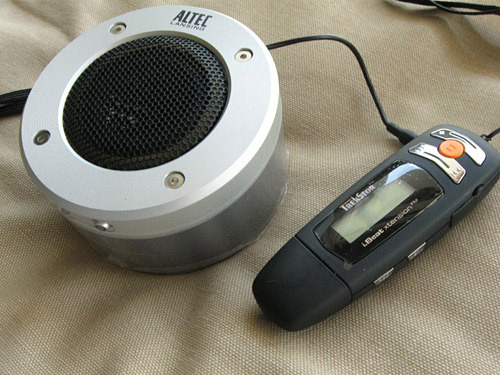 The use of a playback device can greatly increase the chances of locating Aquatic Warbler. The surest way of finding the next Aquatic Warbler in Ireland is without doubt a sustained programme of ringing at suitable sites along the south coast during August and September and perhaps even into October for sites even further towards the south-west. Potential locations include the Slaney valley, North and South Slobs, south Wexford wetlands, the Waterford estuaries, Ballyvergan, Ballymacoda, and similar sites in Co. Cork. Small sites which hold migrant Sedge Warblers in autumn and which can retain birds for several days, even those sites well inland from the coast, are all worth inspection. 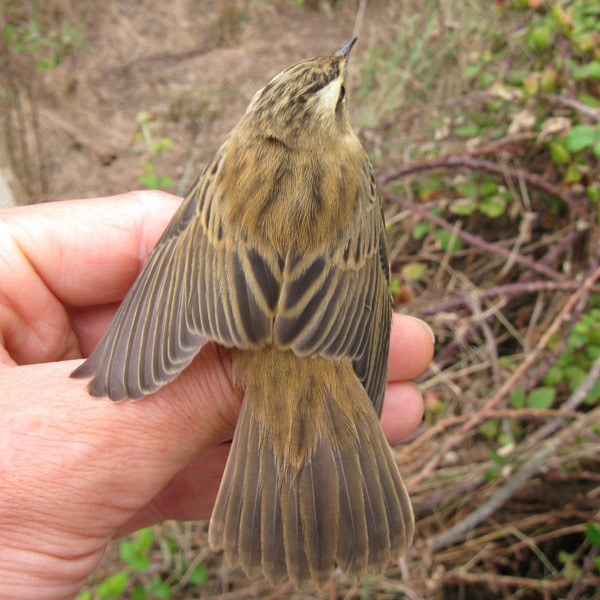 The best technique for surveying migrant Aquatic Warblers is to use mist nets placed on the periphery of, and up to 50m inside a reedbed plus the use of a tape lure with a mixture of both songs and calls. A standardised ringing program based on the above method is currently used in many European countries along the migration routes to compare numbers, distribution, ringing effort, etc. The tape lure or playback system can increase the probability of trapping a bird six-fold compared to using nets without one (Juillard 2006). Bear in mind that playback systems should always be used judiciously with careful consideration to avoid disturbing any similar species which may still be breeding in late July or August and that all ringing activities need to be carried out in accordance with the specific regulations. The playback system should be operational an hour before dawn and continue until 11-12am. If there are no results then it can also be worth trying for a few hours just before sunset as the birds are also quite active during this period. Aquatic Warbler does not present too much of an identification challenge if seen reasonably well and the only real confusion species in Ireland is likely to be Sedge Warbler (Acrocephalus schoenobaenus). Several papers and books deal admirably with the field characters and all are worth reading in depth (Harris et al 1989, Walbridge 1991, Mullarney et al 2009). The probability is that most autumn records in Ireland will involve juvenile or first-winter birds. Overall they generally appear quite warm yellow and black, somewhat less brown than the average Sedge Warbler. However, worn adults, which can turn up from mid-July onwards can look surprisingly grey and black with variable amounts of yellowish tones around the head and upper breast. Also, adult Aquatic Warbler normally have fine dark streaks on the upper breast and along the flanks which are usually absent on adult Sedge Warbler. All photographs taken by Eugene Archer at Donges Est, Loire-Atlantique, France. A rather worn individual with bleached feathers on upperparts. The fine, dark streaks on the breast and flanks are clearly visible in these photos. The dark stripes on the mantle are evident on this bird. This bird is still retains reasonably fresh plumage making it more similar to a juvenile. This bird still has retained its plumage in good condition. A very grey-and-black individual with only a trace of yellowish around the head. A fresh juvenile Aquatic is a stunningly beautiful bird with the yellow tones ranging from pale buff to rich orange and contrasting strongly with black feather centres on the upperparts and the black stripes on the head. To my eyes the quickest and perhaps most reliable feature to check on a potential Aquatic Warbler is the pale lores which give the bird quite a gentle, open-faced expression, almost always in complete contrast to the darker face of a Sedge Warbler. The dark eyestripe behind the eye on Aquatic Warbler can be quite broad and blackish, sometimes looking more like a dark patch rather than a stripe, and it accentuates even more the open-face appearance. Sedge Warblers, by contrast, have a rather distinct dark stripe between eye and bill, they are often dark on the cheeks and ear-coverts and have a somewhat more "fierce" expression. Most juvenile / first-winter Aquatic Warblers have a uniformly pale breast although a minority show small, indistinct dark streaks or spots on the upper breast. 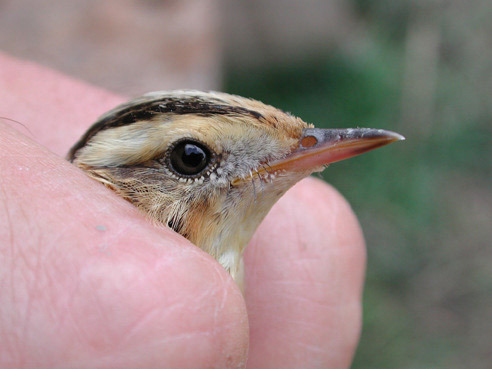 The vast majority of juvenile Sedge Warblers show an obvious necklace of small dark spots, sometimes very distinctly so at the sides of the breast. Although there is not a huge difference in the actual pattern of the remainder of the upperparts, Aquatic Warblers appear more contrasting due to very blackish feather centres and paler, more buff-yellow edges. 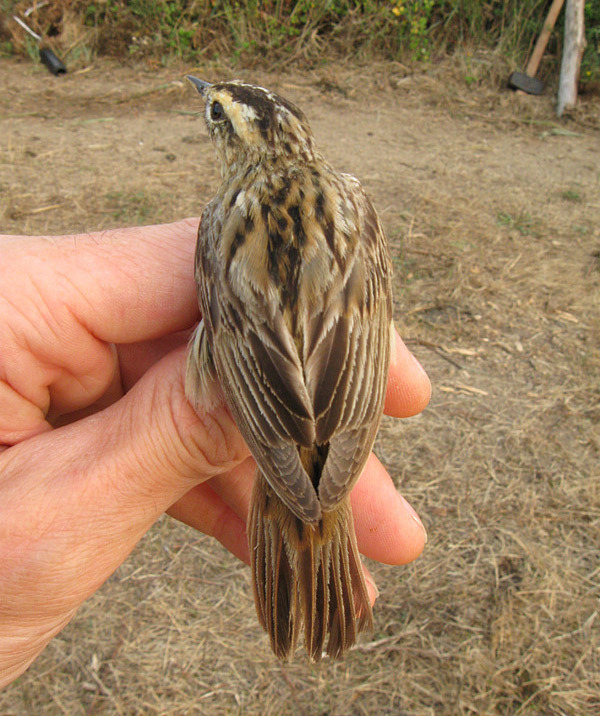 The streaked rump of Aquatic Warbler is diagnostic but very difficult to see under field conditions as are the pointed tail feathers but be aware that the shape of juvenile tail feathers is also more rounded compared to those of adults. Two finals point to note are the rather pinkish legs of Aquatic Warbler, not diagnostic, but a supporting character to bear in mind compared to the colder, brownish-flesh coloured legs of Sedge Warbler and finally the calls: Sedge Warbler giving a relatively strong, almost explosive tongue-clicking "tchuk" compared to a softer, less aggressive "tuc" or "tuuc" from Aquatic Warbler. Except where indicated, all photographs taken by Eugene Archer at Donges Est, Loire-Atlantique, France. This bird is showing a typical head pattern and colouration of juvenile / first winter Aquatic Warbler. This Sedge Warbler shows dark lores and a fairly normal amount of pale edges to the central crown feathers. A very typically marked juvenile / first winter Aquatic Warbler. This Sedge Warbler is overall much browner in colouration than Aquatic Warbler. The loral and eyestripe patterns on this individual are noteworthy. Sedge and Aquatic Warblers side by side for comparison. Photo 19 (Photo: Margaux Pizzo). Photo 20 (Photo: Margaux Pizzo). Published records to 31st December 2015. 20th September 1903. Immature male. Bull Rock Lighthouse, Co. Mayo. Obtained. Ruttledge et al. 1954. 2nd June 1906. Achill Island, Co. Mayo. Ruttledge et al. 1954. 9th August 1913. Female. Tuskar Rock Lighthouse, Co. Wexford. Picked up dead. Ruttledge et al. 1954. 2nd September 1958. Great Saltee Island. Co. Wexford. Irish Bird Report 6: 32. 1st to 2nd October 1958. Great Saltee Island, Co. Wexford. Irish Bird Report 6: 32. 28th August 1961. Great Saltee Island, Co. Wexford. Irish Bird Report 9: 21. 31st August 1961. Comillane, Cape Clear Island, Co. Cork. Irish Bird Report 9: 21. 17th to 24th September 1963. The Waist, Cape Clear Island, Co. Cork. Trapped. Irish Bird Report 11: 32. 14th to 15th October 1973. Central Bog, Cape Clear Island, Co. Cork. Irish Bird Report 21: 28. 29th to 30th September 1976. Secret Valley, Cape Clear Island, Co. Cork. Irish Birds 1:91. 11th to 12th October 1976. East and Central Bogs, Cape Clear Island, Co. Cork. Irish Birds 1: 91. 3rd September 1981. East and Central Bogs, Cape Clear Island, Co. Cork. Irish Birds 2: 225. 26th September 1989. East Bog, Cape Clear Island, Co. Cork. Irish Birds 4: 250. Many thanks to all the ringers and the ACROLA team at Donges Est on the Loire Estuary for their advice, friendship and enthusiasm during the ringing camps, in particular Julien Foucher, Benjamin Jeanneau, Etienne Giraudot, Hubert Dugue and Romain Lorrilliere. Thanks also to Margaux Pizzo for supplying photos 19 & 20 and to Ricard Gutiérrez and Júlio Manuel Neto for supplying information from Spain and Portugal respectively. Atienza, J.C., Pinilla, J. & Justribo, J.H. 2001. 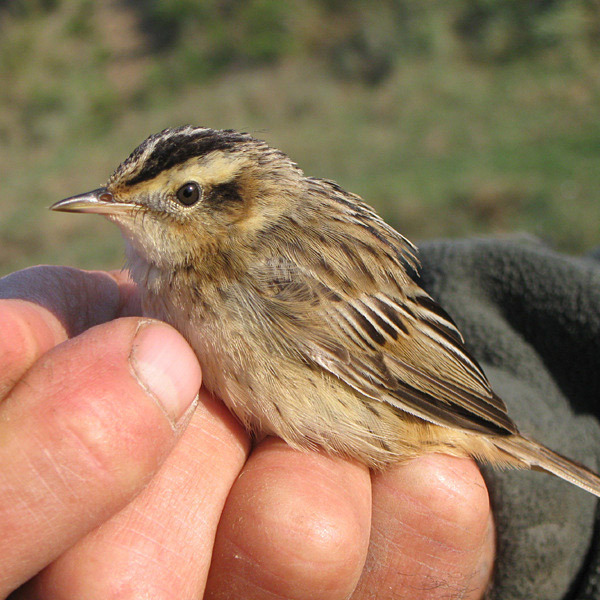 Migration and Conservation of the Aquatic Warbler Acrocephalus paludicola in Spain. Ardeola 48: 2. Baker, K. 1997. Warblers of Europe, Asia and North Africa. Christopher Helm, London. Bargain B., Guyot G. & Le Neve A. 2008. Première zone d'hivernage du Phragmite aquatique Acrocephalus paludicola découverte en Afrique [First wintering site for Aquatic Warbler Acrocephalus paludicola discovered in Africa]. Ornithos 15: 6. Bil, W. 1987. Veel Waterrietzangers bij Makkum in zomer van 1986 [Many Aquatic Warblers near Makkum in summer of 1986]. Dutch Birding 9(4): 176. BirdLife International 2010. Species factsheet: Acrocephalus paludicola. [online] Available from: http://www.birdlife.org/datazone/species/index.html?action=SpcHTMDetails.asp&sid=7597&m=0 [Accessed June 2010]. Chenaval, N., Lorrillière, R., Dugué, H. & Doxa, A. 2010 (in press). 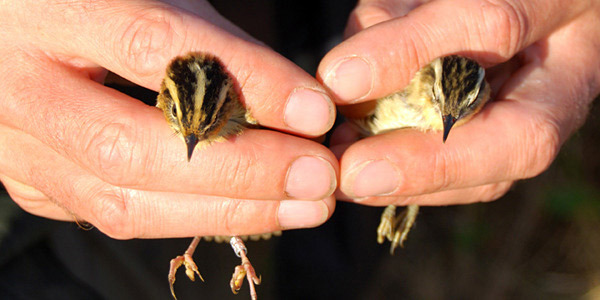 Phénologie et durée de halte migratoire de quatre espèces de passereaux paludicoles en migration post-nuptiale en estuaire de la Loire, Donges (44) [Phenology and stopover duration of four passerines species during post-nuptial migration at Donges on the Loire estuary, France]. de By, R.A. 1990. Migration of Aquatic Warbler in western Europe. Dutch Birding 12(4): 165-181. Doxa. A., Lorrilliere. R. & Dugue. H. 2008. Valorisation scientifique de la base de données du camp de baguage de Donges-Est 2003-2007 [Scientific analysis of database from the ringing camp at Donges Est, 2003-2007]. [online PDF] Available from: http://www.acrola.fr/publications.html [Accessed June 2010]. Evans, P.G.H. & Lovegrove, R.R. 1974. The Birds of the South West Irish Islands. Irish Bird Report 2(9): 33-64. Flumm, D.S. 1984. Letters (Identification pitfalls: Aquatic Warbler). British Birds 77(8): 377. Foucher. J. & Boucaux. M. 2010. Mission de prospection et de baguage en Afrique de l'Ouest [Ringing and exploration in West Africa]. [online PDF] Available from: http://www.acrola.fr/publications.html [Accessed June 2010]. Gorman, G. 2002. Aquatic Warbler. Alula 8(2): 62-65. Harris, A., Tucker, L. & Vinicombe, K. 1989. The Macmillan Field Guide to Bird Identification. Macmillan Press Ltd., London and Basingstoke. Heredia, B. 1993. 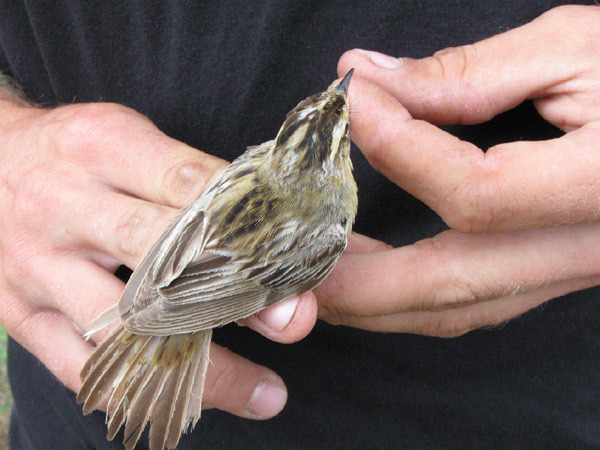 The status and conservation of Aquatic Warbler. Birding World 6(7): 294-295. Herroelen, P. 1991. Trek van Waterrietzanger in West-europa [Migration of Aquatic Warbler in western Europe]. Dutch Birding 13(2): 65-66. Juillard. R., Bargain, B., Dubos. A. & Jiguet. F. 2006. Identifying autumn migration routes for the globally threatened Aquatic Warbler Acrocephalus paludicola. Ibis 148: 735-743. Kennedy, P.G., Ruttledge, R.F. & Scroope, C.F. 1954. Birds of Ireland. Oliver & Boyd, Edinburgh. Mauer, K. 1980. Captures of Aquatic Warbler Acrocephalus paludicola on Putten in 1970-73. Dutch Birding 1(4): 122. Mullarney, K., Zetterström, D. & Svensson, L. 2009. Collins Bird Guide 2nd ed. HarperCollins, London. Neto, J.M., Encarnacao, V. & Fearon, P. 2010. 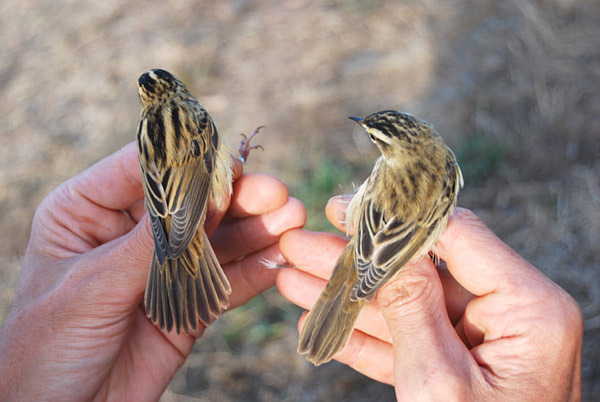 Distribution, phenology and condition of Aquatic Warblers Acrocephalus paludicola migrating through Portugal. Ardeola 57: 1. Parkin, D.T., Collinson, M., Helbig, A.J., Knox, A.G., Sangster, G. & Svensson, L. 2004. Species limits in Acrocephalus and Hippolais warblers from the Western Palearctic. British Birds 97(6): 276-299. Poulin, B., Duborper, E, & Lefebvre, G. 2010. Spring stopover of the globally threatened Aquatic Warbler Acrocephalus paludicole in Mediterranean France. Ardeola 57(1): 167-173. Sangster, G. 1997. Trends in systematics, Acrocephalus and Hippolais relationships: shaking the tree. Dutch Birding 19(6): 294-300. Schäffer, N. & Newbery, P. 1999. The elusive Aquatic Warbler. World Birdwatch 21(4): 23-25. Schäffer. N., Walther. B.A., Gutteridge. K., & Rahbek. C. 2006. 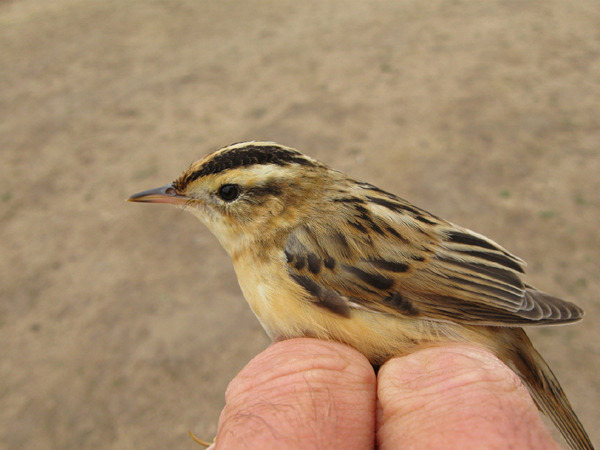 The African migration and wintering grounds of the Aquatic Warbler Acrocephalus paludicola. Bird Conservation International 16: 33-56. Snow, D.W. & Perrins, C.M. (eds) 1998. The Birds of the Western Palearctic Concise Edition, Volume 2. Oxford University Press, Oxford. Svensson, L. 1992. Identification Guide to European Passerines 4th ed. Stockholm. Vergeichik, L. & Kozulin, A. 2006. Breeding ecology of Aquatic Warblers Acrocephalus paludicola in their key habitats in SW Belarus. Acta Ornithologica 41: 2. Walbridge, G. 1991. 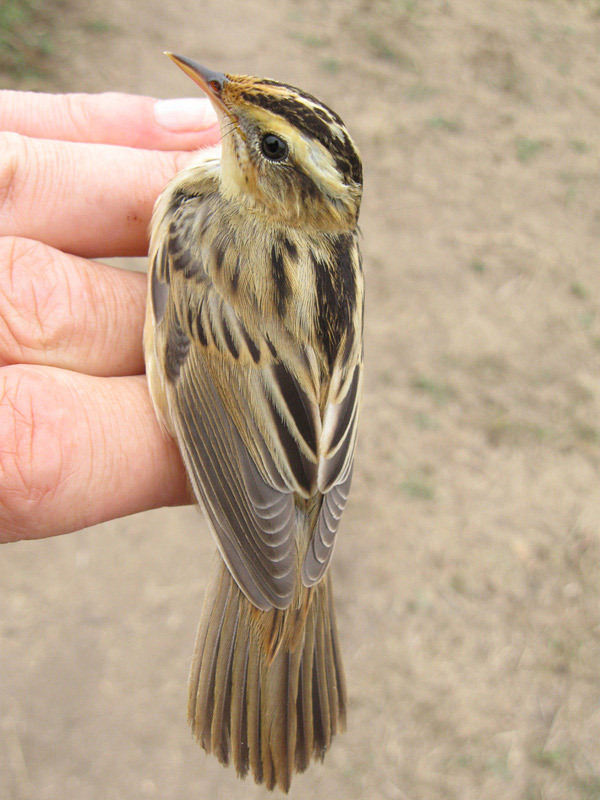 Identification of Aquatic Warbler in autumn. Birding World 4(7): 237-241. Map showing approximate current distribution of Aquatic Warbler with breeding range (red), autumn migration route (orange) and presumed spring migration route (blue). Aquatic Warbler (Acrocephalus paludicola, Vieillot, 1817) is a monotypic species of marsh warbler. It has a rather fragmented and localised breeding range in eastern Germany, Poland, Lithuania, Latvia, Belarus, Ukraine, Hungary and possibly as far east as the River Ob in Russia. It is a migratory species spending the winter in sub-Saharan West Africa. The migration route of central European birds initially takes them west across northwest continental Europe as far as Normandy or exceptionally to the south coast of England and elsewhere. The return trip appears to take a more easterly route.